Snapshot: The Phil & Teds Voyager (with double kit) is a tandem stroller. But how safe and easy to use is it? Passed all major safety tests. OK to park and load. Suitable for newborn using the pram bassinet. Can convert main and extra seat to pram bassinet. Poor to fold and carry. Very bulky and very heavy when folded. The 4 buckle tongues could be inserted in the wrong slots. Safety score (50%): In our stroller safety assessment, conducted to the AS/NZS 2088:2013 standard, we look for hazards to the child and the carer using the stroller. Major failures include insufficient child retention, strangulation hazards, poor stability (tipping), head entrapment hazards and structural durability failures. 8.0 = 1 minor failure. 7.0 = 2 minor failures. 6.0 = 3 or more minor failures. 4.0 = 1 major failure. 2.0 = 2 or more major failures. Ease of use (50%): Assesses adjustments, loading, moving and carrying. Strollers are put through their paces in real life. We check how easy it is to adjust the safety harness, seats and handle. We apply the brakes and access the bottom basket. We push them over rough terrain, up and down stairways and through doorways. We fold and unfold them, carry them and lift them into and out of a car boot. 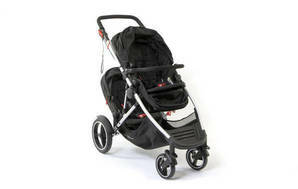 Durability: Strollers are put on a bumpy “rolling road” machine for 64 hours at a speed of 5km/h. We also attach each stroller to a machine that continuously simulates the action of mounting a kerb. Strollers suitable for jogging get an extra 10 hours at 10km/h on the rolling road. Durability does not contribute to overall score. To earn our recommendation, a single stroller must have an overall score of 70%, double strollers must have an overall score of 65%. We don’t recommend strollers with any major safety or durability failures. Avg price includes the second seat where it’s sold separately.